Dr. Patel is a theorist with research interests in real estate and finance, asset pricing, and real options. In his job market paper, he studies the geographical patterns of technology adoption and stock returns. Dr. Patel also studies the economics of skyscrapers. He analyzes how capital markets affect skyscraper height in his paper titled “Form Follows Finance” with Robert Helsley. At Cal Poly, Dr. Patel teaches Futures and Options, and Real Estate Investments. 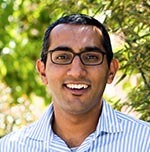 Dr. Patel joined the Cal Poly Finance faculty in 2013. He received his Bachelors in Chemical Engineering from Georgia Tech, Masters in Financial Engineering and PhD in Business from UC Berkeley. Dr. Patel also has experience in trading power, natural gas, and coal. Finally, Dr. Patel founded OptiOpt Inc. — a start up (failed) that offered advice on how to manage a retirement portfolio.